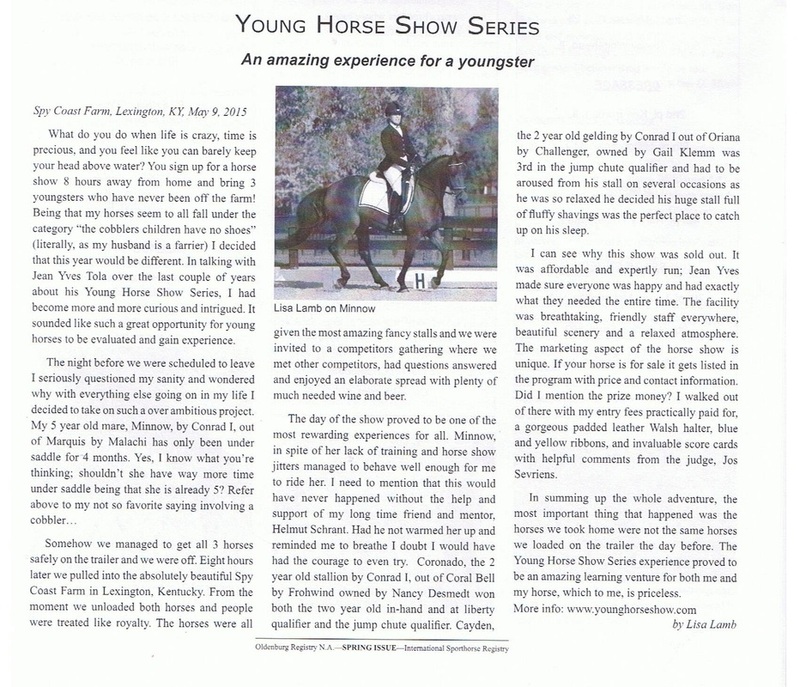 WELCOME TO THE YOUNG HORSE SHOW SERIES WEBSITE! YHS is proud to announce and welcome C4 Equestrian as a new national sponsor for the 2019 YHS season. YHS will also have their amazing custom YHS belts available for purchase at the shows. We are looking forward to great season together, hope you will enjoy their product and thank them for their support. "FootingFirst is always so happy to be a part of the Young Horse Show Series. We love supporting a program that not only gives young equine athletes valuable show experience, but that it also showcases the future of our sport. Every year we are amazed by the quality of the horses who participate." After five years of existence, this will be the second year the Young Horse Show Series can celebrate ALL horses showing being registered and verified with proof of age. This is quite a feat, as we started requiring competing horses be registered with a breed registry during the first year. Yearlings were the first to be required to be registered, and from there, each age group has since complied. We are very proud of how far we have come with recognizing the fact that horses are age verified and registered, we support ALL breed registries and encourage breeders to join their offspring appropriately. ​Thank you for your participation, and we look forward to continuing the success with the YHS Series. The Young Horse Show Series is designed to provide sporthorse breeders as well as owners, trainers and riders of all disciplines an affordable show venue to introduce and evaluate their young horses to the show environment and “put on necessary mileage” with appropriate and special classes suitable to the proper development of young horses. It is also intended to create a sales environment where numerous young horses are in a single location and their talents displayed in front of a buying audience. Created in 2009 by Jean-Yves Tola and with the help of the North American Studbook directors and professionals of the sporthorse industry, the first “test” show took place at Spy Coast Farm in 2010. The response and obvious success of the show motivated Lisa Lourie and Jean-Yves Tola to take it to the next level. A meeting with Mark and Katherine Bellissimo, other ESP partners and key figures followed shortly thereafter and because of their vision, generosity and real understanding of the industry’s needs towards young sport horses in the US, the Spy Coast Farm Young Horse Show series was created. A final was set for December 2011 ! The 2011 YHS season was a terrific success, with well over 100 horses participating, 60 plus qualified and more than 30 entered in the finals. It reached its pinnacle on December 8th and 9th 2011 in Wellington during a wonderful and unforgettable final event. Both International Judges were astounded by the quality of the horses and the professionalism of the event. The first season would not have been possible without the help of many individuals and companies. We would like to thank everyone for their trust and support. A special “thank you” goes to Lisa Lourie and Spy Coast Farm, ESP, Sweet Oak Farm, Cav-I Farm and Sakura Hill Farm, without whom the 2011 season would not have been possible. Many thanks as well to the officials that have participated at the shows, the North American Studbook directors and assistants, The Equine Media Project and of course to all the generous sponsors of the 2011 season. 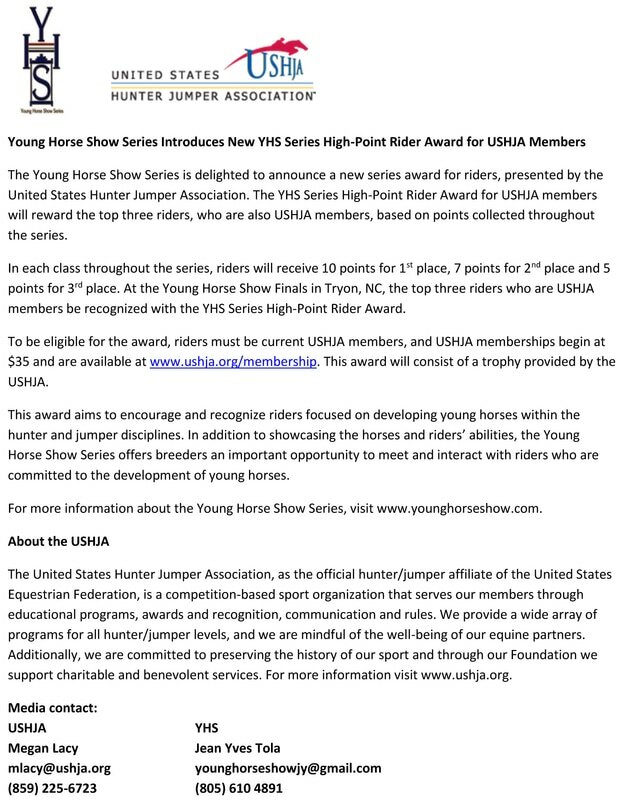 5 seasons are now behind us and the YHS Series is now the new standard for breeders as well as young horse owners and trainers here in the US. Over the years, the numbers have doubled and the business has flourished for every one involved. The new Tryon Resort and Equestrian Center has become the home of the YHS Finals. Their excellence in Equine Sport production and support of the young horses has proven to be a huge benefit for the Equine enthusiasts. They have also created a Perpetual Trophy for each year's Champion of the High Score Best American bred horse at the Finals. An additional and most important “SPECIAL THANK YOU !” goes to all the participants of the YHS series! Thank you and Happy 2019 YHS season!